Samsung has unveiled the much leaked, and rather gargantuan Galaxy Note Pro 12.2 tablet at CES 2014 in Las Vegas. In another new line of products from the Korean manufacturer, the Galaxy Note Pro 12.2 is a supersized slate equipped with the firm's S Pen stylus and a 2560 x 1600 WQXGA display. That display packs four million pixels and a 16:10 aspect ratio. The new tablet brings Android 4.4 KitKat to the table, along with an 8-megapixel rear-facing camera and a 2-megapixel webcam. There's also a giant 9500mAh battery, an octa-core Exynos 5 processor in the Wi-Fi and 3G versions/a 2.3GHz quad-core Snapdragon 800 in the LTE model, and an impressive 3GB RAM. It features a Qualcomm Snapdragon 800 quad-core processor doing the heavy lifting, while the slate itself is just 7.95mm thick with the Wi-Fi version weighing in at 750g. Samsung is also crowing about the new Magazine UX user interface tool, which sits within the new Galaxy Note Pro 12.2 and allows for easier organisation of, and access to, the most frequently used content. "The UX enables them to organize their favorite content in an easy-to-use dashboard with automatic feed or news updates and then quickly access the most frequently used apps for a more comfortable reading experience," the company wrote in a press release. "By utilizing a screen size that is more comparable to traditional magazine-sized material, content is easier to view in its original format when reading digital magazines or e-books." At Samsung's CES press conference, the company also touted the tablet's impressive and intuitive multi-tasking capabilities, which allow users to easily pin up to four different apps around the screen. 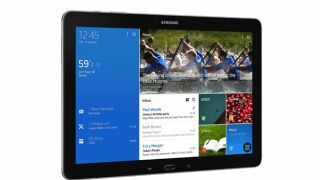 Samsung is yet to confirm pricing, but the Note Pro 12.2 as well as the Galaxy Tab Pro 12.2, 8.4 and 10.1 slates will all go on sale before the end of March 2014.